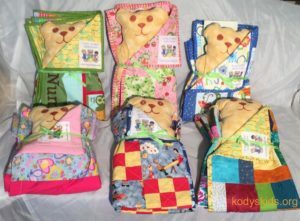 Kody's Comfort Quilts | Kody's Kids, Inc.
Our goal is to bring comfort and encouragement to children in crisis while bringing public awareness to their plight. Each year hundreds of children suffer the debilitating effects of serious illness or abuse. When faced with procedures, hospital stays, counseling, or just not feeling well, sometimes comfort can come in the simplest form. Kody’s Comfort Quilts Project was created for this purpose. Handmade quilts sewn by community members and a teddy bear are given to children in need with the intention of offering comfort and encouragement while they brave their situation, but also as a keepsake to remind them that there are always people who care. 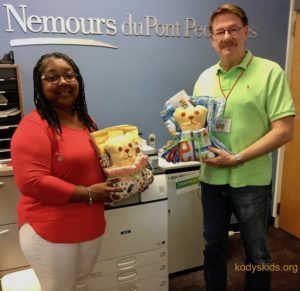 Kody’s Comfort Quilts have been presented to children from local therapy and doctor offices, as well as children being treated at Nemours Dupont Pediatrics and A.I. DuPont Hospital for Children. Recommended size is 42″ x 34″. The quilt color and pattern should be suitable for boys and girls. For a list of our other needed items and how you can help, click here.